From the maker of angels, comes her vision of fairies... "Fairy Dreams" is Marilyn's whimsical interpretation of a childlike fairy drifting through the forest of sleep. She carries strands of beads that become the seeds for magical dreams. The generous use of silver braid makes her gown sparkle with stars. 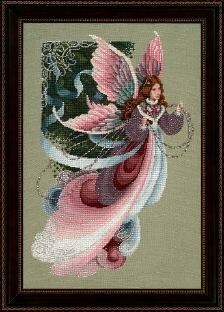 Marilyn has designed a detailed 1 strand over 1 thread face for Fairy Dreams......L&L 41. A 2 strands over 2 threads face is available and can be substituted for the original 1 strand over 1 thread face if the original face is too difficult for you to stitch. 12 1/4" x 18 1/4"
Frame number 491CW from Larson-Juhl. Copyright © 1996 Marilyn Leavitt-Imblum. All rights reserved.